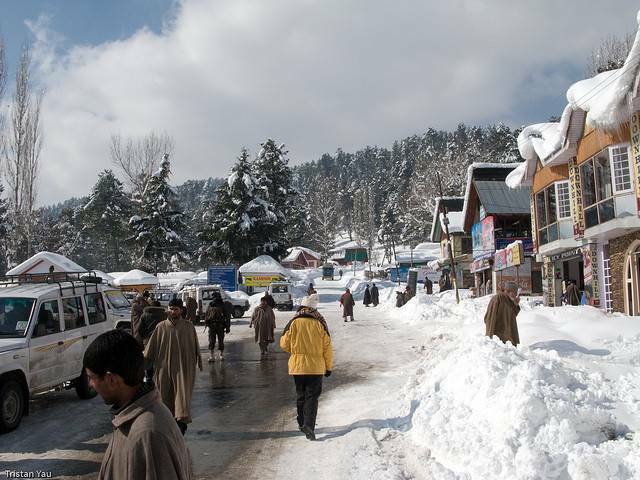 Tangmarg is located 39 KMs from Srinagar and is a major stop for all the buses and taxis going to Gulmarg. The road till Tangmarg is four lanes, all-weather motor-able road. During winters, Tangmarg is the stop where one can hire taxis to go to Gulmarg as one cannot take one’s own vehicle to the top. One can hire taxis with chained tyre as well as complete winter ware like overhauls as well as snow boots. The road after Tangmarg to Gulmarg is covered with snow in winters thus the authorities take adequate precautions for the safety of the travellers. That is the reason local taxis are allowed to ply on the road to Gulmarg from Tangmarg not any other vehicle. Stop over at Tangmarg and refresh yourself.